Is Russia's Deadliest Tank Already in Serial Production? The head of Rostec recently alleged that the T-14 ‘Armata’ has entered serial production. 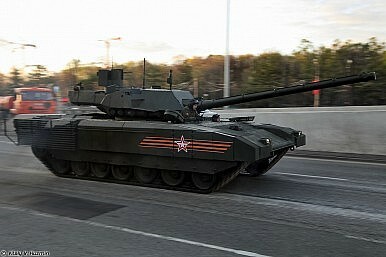 In a recent interview with The Wall Street Journal, the CEO of Russian Technologies State Corporation (Rostec), Russia’s largest defense industrial conglomerate, claimed that the third-generation T-14 main battle tank (MBT), an armored vehicle based on the ‘Armata’ universal chassis system, has already entered serial production. “[T]hat’s already in serial production. There are things that are in the development and testing stages, things that we’re only just starting, we’ll stop,” Rostec CEO Sergei Chemezov said in the interview, answering a question about how shrinking government revenues have impacted the company’s business. “There was a decision by the president and prime minister that what has already been started should be carried out to the end. You can’t quit when you’re halfway there. Money has already been invested, and if we stop without finishing, then that will be lost money,” he explained. Chemezov expects government defense orders to be reduced by 10 percent in 2016. Whether the T-14 has entered serial production is hard to verify independently. It is possible that Chemezov was referring to a larger number of T-14 tanks produced in 2015 and currently undergoing operational trials. Vyacheslav Khalitov, the deputy director of Uralvagonzavod (UVZ), the world’s largest tank maker, said in an interview in February 2016 that his company has produced a trial batch of over 20 T-14 MBTs. The commander-in-chief of the Russian Ground Forces, Colonel-General Oleg Salyukov, said in August 2015 that he expects manufacturing tests for the T-14 MBT to be completed in 2016. The tank is set to go into serial production in 2017 or 2018, with the Russian Ground Forces receiving around 500 T-14 MBTs per year, according to plans from Russia’s Ministry of Defense. In total, UVZ plans to produce 2,300 T-14 Armata tanks by 2020. However, according to media reports the price for the T-14 will eventually come down to around 250 million rubles ($3.1 million) per unit once serial production begins. In comparison, Germany’s Leopard 2a6 MBT costs $6.7 million, the U.S.-made Abrams M1 MBT around $6 million. Sputnik News recently also reported that the T-14 (and possibly the T-15 heavy infantry fighting vehicle) will also be equipped with new ultraviolet (UV) detectors as part of the tank’s active defense system to protect it from incoming enemy fire. Will 3D Printing Speedup Production of Russia’s ‘Deadliest Tank’? Russia’s defense industry has used 3D printing to produce prototype parts for the T-14 Armata tank, a manager reveals.